Schools primarily teach vocabulary and inflection, styles of dress, aesthetic tastes, values, and manners only 1 percent of American teenagers attend independent private high schools of an upper class nature. (G. William Domhoff Who Rules America? 1998, 80–81). The schools for the “1 percent” of teenagers, in America or elsewhere, are isolated from the rest of us, and in these cocoons the ultra-rich cultivate norms and connections. In 2007, I had a peak inside one such institution in St. Gallen, Switzerland. Rosenberg Academy is a school for the ultra-rich—it is a cocoon where the children of the ultra-rich get to know each other, think alike, and re-create the elite which will dominate European business and government in the future. A description of my brief encounter with the ultra-rich is found in my book Schooling, Bureaucracy, and Childhood: Bureaucratizing the Child. The book is available at many university libraries—and you should check it out! On the other hand, if you are from the one percent, you can afford to buy a copy on Amazon.com, where there are new copies for $45, and new ones for $95. Chapter 1 is available on my Academia.edu site, which is here. Upper-class institutions are what sociologist Erving Goffman called “total institutions” that isolate their members from the outside world and establish a set of routines, traditions, and “automatisms” that increase the levels of cohesiveness among people raised in this fashion. Ultimately, Domhoff writes, such separateness results in feelings of superiority and exclusivity for having somehow survived the rigors of an expensive and rigorous education (see Domhoff 1998, 82), a la Harry Potter’s fictional school at Hogwarts. Less fictional is the elite private school I once visited, Rosenberg Academy in Switzerland, where my daughter was scheduled to take an SAT exam on a Saturday morning in November 2007. I read on the Internet that the recommended budget for a student attending there was $50,000–60,000 per student per year, including pocket money of $10,000—15,000. We arrived early, and were asked to wait in a room outside the dining commons. As we sat there, the boys aged perhaps 12–16, but dressed in suit and tie, and the girls, in conservative pantsuits, arrived for the 7:30 a. m. meal. Despite the suits, the boys were squirrelly, just like other teenagers. Except . . . Before the meal started, they lined up behind their chair. They sat down when a hand-bell rang, and the younger students ate feverishly until the bell was rung again, and they were dismissed at 7:45. Only the older students were allowed to remain for a more leisurely Saturday morning breakfast. My wife and I sat in the anteroom watching this for the hours my daughter was taking the exam. We listened to uniformed teenagers chatting in four or five languages (French, Italian, English, German, and maybe Russian) as they passed through, ignoring our presence. I remember spending some time gazing at the school’s trophy cabinet, which had the standard trophies for tennis, golf, and so forth. But also one for the school’s race car team, even though under Switzerland’s laws, students the under 18 were too young to qualify for a driver’s license. My daughter claimed that Rosenberg reminded her of Hogwarts School of the Harry Potter series and took particular amusement at the young man who asked if he could loosen his tie while taking the SAT. Hogwarts is particularly relevant, I think, as a literary metaphor for the isolated upper class. J. K. Rowling’s use of Hogwarts as a literary device, is an acknowledgment that the upper class think and act differently than we ordinary mortals do, even if their kids chafe at the discipline. But the point of such private schools is to create a habitus of privilege. Boys growing up in such a place feel uncomfortable without a suit and tie, even at Saturday breakfast, and will intuitively seek out others with similar feelings. Such markers of caste are perhaps most obvious in a place like Rosenberg. But they are also found in culture created in American schools where bureaucratic “measurable standards” and culture are established to separate and track the natural-growth children of concerted cultivation, segregated inner-city children, and Hogwarts-bound children into their meritocratically correct slots. Source: pp. 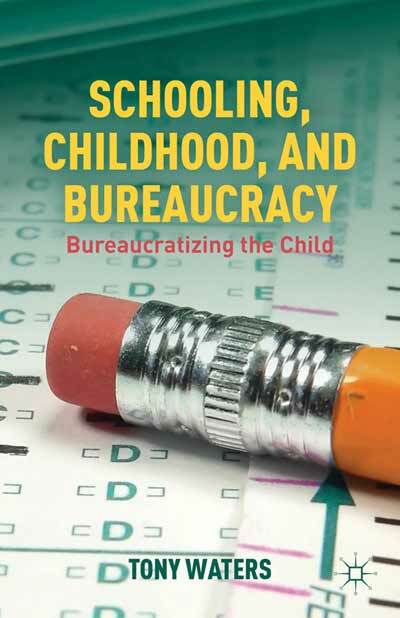 129-130, Schooling, Bureaucracy and Childhood: Bureaucratizing the Child, by Tony Waters. Palgrave MacMillan, 2012. P.S. Even if you do not read my book, be sure to read Erving Goffman! Re-reading, I just noticed that I made an implicit comparison between mental hospitals and elite academies when I wrote this. Goffman’s main work about “total institutions” is derived from his participant observation as an orderly in a mental institution. His point, derived though from the 1950s era mental institution in Maryland, though, applies to Rosenberg Academy, too. Both institutions create a cohesive social group which confirms each others views. And at Rosenberg, they do it during childhood, and away from alternative views. In this respect, both are the “1%”.